Jack Marriott celebrates his equaliser for Posh at Southend. Photo: Joe Dent/theposh.com. Peterborough United stopped the rot by battling to a 1-1 League One draw at Southend tonight (October 17). Jack Marriott’s equaliser 10 minutes into the second-half ended a run of three straight defeats for Posh. They were denied an even better result by some fine saves from home ‘keeper Mark Oxley. Posh midfielder Jermaine Anderson tussles with Southend's John White. Photo: Joe Dent/theposh.com. Southend had taken the lead in the 10th minutes when Marc Antoine Fortune took advantage of an error by Posh skipper Jack Baldwin to claim his first goal of the campaign. Posh were back in 3-4-1-2 mode with Gwion Edwards as a right wing-back, Jermaine Anderson as a number 10 and Marcus Maddison deployed as a striker alongside top scorer Marriott. Leo Da Silva Lopes started instead of fading former skipper Chris Forrester. Of course a manager can employ whatever system he wants and pick any combination of players, but a disastrous error will always wreck the best laid plans. Step forward captain Baldwin, a player haunted by personal horrors for much of the season, and who endured a 20-minute first half spell which wouldn’t have looked out of place in a Scream movie. Posh skipper Jack Baldwin in possession at Southend. Photo: Joe Dent/theposh.com. First his ninth-minute backpass was intercepted by Dru Yearwood who thankfully dithered for long enough for the skipper to get back and clear. But a minute later Baldwin’s attempted pass out of defence went straight to Fortune who accepted the gift to claim his first goal of the season. 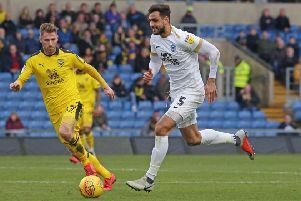 The goal galvanised Southend, but Posh had the best chance to score next when Maddison’s perfect set-piece found Baldwin unmarked eight yards from goal midway through the half. He headed well over and Posh promptly sat back for the rest of the half and watched the home side pass the ball safely yet without much menace. Southend fielded a makeshift back four including two midfielders, but Posh failed to time a pass to unleash Maddison and Marriott who had a clear advantage in pace. Posh should actually have scored first as Anthony Grant intercepted a poor clearance, raced into the area, but failed to deliver the easy pass that would have given Marriott a tap-in. Otherwise Maddison’s set pieces offered most hope. A couple of corners lead to entertaining scrambles in the home area. But then Posh found an equaliser as a cross from Edwards was flicked on by Maddison, then poorly defended and rebounded off Andrew Hughes for Marriott to convert his 10th goal of the season from close range. Southend were unhappy with the award of a throw-in to Posh before the cross came in. Maddison now came alive and twice forced fine saves from Oxley with shots from the edge of the area as Posh took charge for a spell which ended with Edwards flashing a shot wide from a tricky angle. Southend had their moments also in an end-to-end finish to the game. Bond had to save well from Michael Timlin and from a Josh Wright shot from distance. Back came Posh and Oxley made a brilliant save to keep out a header from substitute Callum Chettle following an Edwards cross five minutes from time. Posh were hanging on a little towards the end, but a draw at a ground where the home side remain unbeaten was not a bad return. Posh: Jonathan Bond, Jack Baldwin, Steven Taylor, Ryan Tafazolli, Andrew Hughes, Anthony Grant, Jermaine Anderson (sub Callum Chettle, 77 mins), Leo Da Silva Lopes, Gwion Edwards, Marcus Maddison, Jack Marriott. Unused substitutes: Conor O’Malley, Liam Shephard, Chris Forrester, Ricky Miller, Idris Kanu, Danny Lloyd. Southend: Mark Oxley, Jason Demetriou, John White, Ryan Leonard, Michael Timlin, Josh Wright, Dru Yearwood, Anthony Wordsworth, Stephen McLaughlin (sub Theo Robinson, 68 mins), Simon Cox, Marc-Antoine Fortune (sub Nile Ranger, 68 mins). Unused substitutes: Nathan Bishop, Stephen Hendrie, Michael Klass, Elvis Bwomono, Amadou Ba. Goals: Posh - Marriott (55 mins). Southend - Fortune (10 mins). Cautions: Posh - Baldwin (foul), Da Silva Lopes (foul). Southend - Demetriou (foul), Yearwood (foul), Cox (foul).